As atheists, most of us have considerable experience with self-control. We have learned (sometimes the hard way) to prioritize our personal safety over any noble desire to speak out in defense of our rights or in opposition to the irrational and destructive nature of religious belief. Most of us have bitten our tongues so often as to have developed callouses! This is understandable, particularly for those of us who reside in pockets of widespread religious extremism. 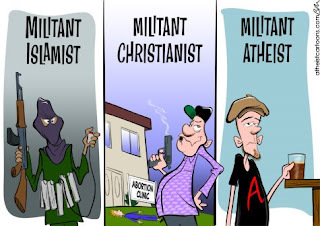 Nobody is interested in being a martyr for a cause, especially when some atheists continue to believe that there is no need for atheist activism of any kind. And yet, it does raise a bit of a predicament for those of us who are interested in reducing the influence of religious extremism in society, strengthening church-state separation, advancing atheist equality, and the like. By remaining silent on the subject of religion, we become as complicit in maintaining religious extremism as the religious moderates who refuse to denounce the extremists. By refusing to speak out in defense of our fellow atheists, we make sure that atheist equality will remain a pipe dream. Look at the title of this article from MSNBC: "Never Talk About Religion in a Bar" and there is little question that it conveys a message. The brief article reports on an incident in San Diego where a Muslim shot a Christian multiple times in a bar after the two had been arguing over religion. The implication is chilling: discussing religion is not safe. At some level, it appears that our aversion to risk may limit what we can accomplish. The hard part is that this is - and must be - an individual decision which each of us makes for ourselves after careful consideration of our life circumstances. As we identify obstacles to speaking out, perhaps we can collectively find ways to reduce the risks.